Canoeing on the tidal Thames. Access to the Thames in central London is not easy. The river was once busy with boats and ferries carrying passengers along the river, but most of the old public steps are now fenced off and locked. In the heart of London, where the river is squeezed between high river walls, there can be a difference of seven metres (23 feet) between high and low tides. The tide can flow at up to five miles an hour and the river can be very choppy. Waves from passing boats also add to the challenge. 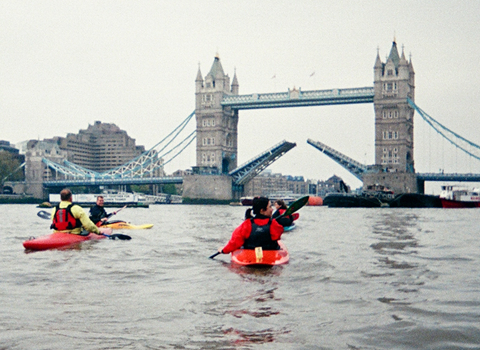 The tidal Thames is not the place for an inexperienced kayaker or canoeist, but several kayak clubs actively paddle on the River Thames, and will ensure that inexperienced kayakers can go out under the guidance of experienced canoe coaches or leaders. See Canoe training in London. If you have the experience to take a canoe on this fast, tidal river, the following tips may be useful. Access point are few and far between – and should be inspected before you set off. Most of the River Thames in central London is enclosed by sheer walls. Once in the water it may be impossible to get out. At low tide, access points may be inaccessible due to deep mud. 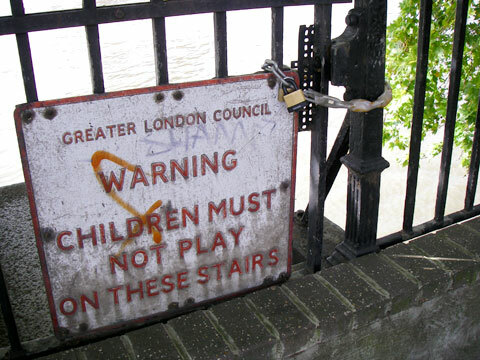 River Thames steps can be very poorly maintained and slippery. It may be very difficult to use these steps if the tide is flowing over them. Tidal information for the River Thames is published by the Port of London Authority and is available free from their website. Trips can be planned to travel with the tide, going from one side of London to the other. If you have more time, you can travel with the tide one way, stop for lunch, and then return. Bear in mind that the slack water between tides can last for several hours. Many barges, piers and boats are moored along the River Thames. The tide rushes under these and will drag a paddler with it. Avoid such obstacles. The tidal sections of the River Thames are under the control of the Port of London Authority. You may wish to contact them to inform them that you are on the river. River traffic should keep to the right of the main channel. Kayakers can generally avoid the busy, central channel and can paddle on the quieter water on the side of the river. Other river traffic may not see you. Small craft such as kayaks and canoes are not common on the river. Maintain a good distance from larger craft and be particularly vigilant around piers and other mooring points. It is better to travel as a fairly tight group rather than as a dispersed group – you are more likely to be noticed. River craft cannot approach within a certain distance of Parliament. This includes kayakers. The area to avoid is marked by buoys. Occasional bridge works may mean that the river is closed to river traffic below one or more bridge arches. Such closed arches are marked by a sign bearing three large, red circles. Do not attempt to paddle the river using inappropriate craft, such as sit-on-tops. Pollution. Every year an estimated 39 million cubic metres of raw sewage travels down the river. The problem is particularly bad after heavy rain, when the sewage system cannot carry the extra load and empties directly into the river. Wash your hands before eating and after paddling. Safety. Please read Canoe London’s canoe safety tips before heading out onto the water. As well as informing a contact ashore it is recommended that canoeists about to go on the river should contact London VTS (Vessel Traffic Service) on 020 8855 0315. VTS can give you details of anything happening on the river that might affect your trip. You must always remember to tell them when you have finished your trip. Port of London Using canoes and kayaks on the tidal Thames. The map below shows some possible access points to the River Thames in central London. The map is for guidance only. Indication of an access point does not mean that public access is allowed. Disclaimer: The River Thames can be a dangerous river and should not be attempted by the inexperienced. The information given here is for guidance only. If you wish to paddle on the river we strongly suggest you join one of the many canoe clubs that use the river.